Let's do a giveaway! Not only a giveaway, but a way to shed a spotlight on some exceptionally awesome people. Instead of entering the contest for yourself, you'll nominate a friend (or even a stranger!!) that deserves a FREE session with Kelli Brewer Photography. The best part? Your friend isn't the only one who wins... As the "nominator", you'll get $100 off a session with Kelli Brewer Photography! To enter, you must first "Like" Kelli Brewer Photography on Facebook (if you already do, you're halfway there!). Next, leave a comment on this blog post to enter your friend into the giveaway! Want an extra entry? Share the contest on Facebook by sharing this image detailing the giveaway! The contest runs from November 4th through November 9th! Winner will be announced Sunday, November 11th. FINE PRINT: Winner will be randomly chosen. Open to anyone, but sessions must be conducted within 25 miles of Woodbridge, Virginia. You may not nominate yourself. You may however nominate someone in your family (your mother, husband, wife). Only one entry per person. Wedding and event coverage excluded for redemption. 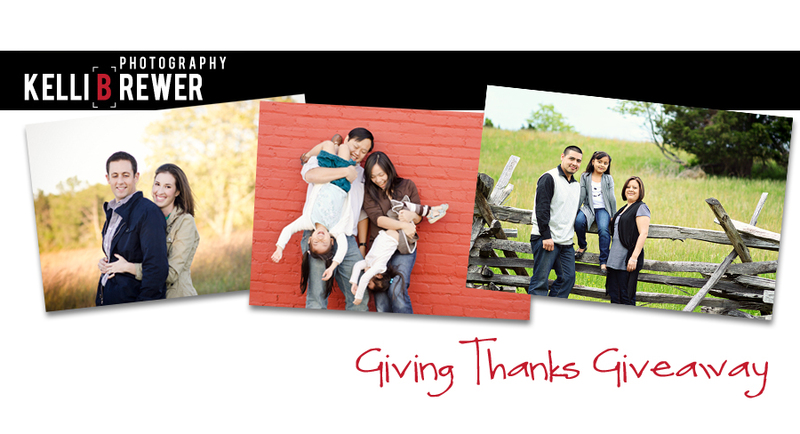 $100 off may not be used towards prints, digital negatives, etc. May not be redeemed on a mini-session. This promotion is in no way sponsored, endorsed or administered by, or associated with, Facebook. We hereby release Facebook of any liability. Use your best judgement! I'd like to nominate a friend of mine in my mom's group. She has a toddler, is a physical therapist (so her job is basically to help people out) and she has MS. She was in remission while pregnant and was generally okay for her daughter's first year but her health has since declined. She is such a great person and has the most adorable daughter. I think her and her little family would greatly benefit from a free photography session. They deserve it. I would love to nominate Don and Carla Jenkins. 2012 has proved to be a crazy year for them! In the spring of 2012 they added their third daughter, Reese. She was born at 34 weeks...which came with it's own set of challenges. Reese spent time in the hospital and now has many allergies which makes life just a little trickier with a baby. At the end of July, Don was in a terrible car accident. It honestly should have killed him. He has had surgeries and been in and out of the hospital. Although it's been 3 months, he has still has not been back to work. He has been rehabilitating and trying to get better. It has been a very long road. Through all of this, his wife Carla has taken care of their 3 small girls and taken care of Don tirelessly. She has hardly left his side...making sure he had everything he needed through all of their trials. She has been an ultimate example to me of service and sacrifice for her family. Through all of it she has had rough days but has kept such a positive and happy perspective. I think the Jenkins family would be perfect for this photo session! I want to nominate the Gallahans. They are such sweet, thoughtful, and serviceable people and definitely deserve a better year! I want to nominate one of my best girlfriends Megan Green. Megan was absolutely shocked but full of joy when she found out she was expecting triplets. She did an amazing job keeping her 3 little boys in for 34 weeks. Her boys were each born at 4lbs in July and at the end of October they were at a healthy 10-11 lbs. I am so happy for her and her three little men and I'm sure she would love to capture this special time because as us mom's know time really flies. Thank you so much Molly, you're so sweet. Funny thing is that I'm going to nominate my hubby. He is so awesome and has been such a rock for me. I definitely don't envy him for having the break the news to our kids that we wouldn't be bringing a new baby home from the hospital. And then to have to turn around and be an emotional and physical support for me while also dealing with the funeral home and cemetery. Not something we ever thought we'd have to deal with, but he was so amazing through all of that. Not that he wasn't amazing before, because he was and still is. He is just an awesome guy and the best Dad to our kids and he is always wanting to get nice family pictures but we can never afford it, so this would be an awesome surprise for him. I'd like to nominate the Brintons, a great family and friends. They have had an extremely busy year adjusting to new family situations as well as welcoming a new baby. Despite of their busy life, they are never more than a phone call away when anyone needs a hand. Great people! I would like to nominate by daughter Lucille. The last two years have been pretty tough for one so young. Her daddy missed her last two birthdays. For the first, he was in Afghanistan and for the second he had already left for Virginia. She has spent hours and hours in the car and sitting in waiting rooms while mommy cames Camille to therapy appointments. Then she has had to learn way more about death than one so little should have to. She was so excited when we were expecting a little one that she went through so much grief when we had a miscarriage. She then couldn't allow herself to be excited because she knew the pain was so great when I got pregnant again and then lost the baby the same week the first would have been born. She of course, still had to go through all that pain again. We then had to move from the only home she remembers (even though it is her third.) She lost all of her friends and activities to come to this faraway place. My once outgoing child has become quite shy in this new place. Then just a few months after we got here, my aunt passed away from a 10 year battle with cancer. I knew it would be a sad time, but I didn't realize how deeply it would affect my Lucille. There have been several nights since, where she has cried for hours. Amid all of this, Lucille is doing great at school and is a wonderful, obedient little girl. As her mom, I would just love to see one really great thing in her life! I'd like to nominate my parents, Tom & Lori Esquina. To sum up, they are the perfect trifecta of what you are looking for in this giveaway. My parents have done so many things for their friends and family not just here but nationwide. To sum them up = awesome would be the word. They have always encouraged mine and my sisters dreams and have never doubted that we could reach the stars. They never asked for help financially even when they struggled with my medical bills growing up. Recently, we lost my youngest cousin, my Dad's niece and it has been a daily struggle for our family. They never had the money to get professional photos even when they hit their amazing 30 years of marriage. I am proud to call them my parents. Kelli - I'd like to nominate my dear friend, Angela Ashman. She had an incredibly tough year and lived through things that I wouldn't wish in anyone's lifetime - let alone in just one year. She and her husband unexpectedly lost her baby girl in May at 37 weeks due to a placental abruption and nearly died herself from the complications. She and her husband have handled their tragedy with such grace and poise that it absolutely astounds me. I know they have difficult days but they remain the most happy, positive people I know. Then in August her younger brother had a difficult surgery to remove a tumor after being in remission from leukemia for 10+ years. He is doing well, but I'm sure the scare was difficult to deal with emotionally. They have stayed remarkably strong through all of this for their 2-year old son (my son Grayson's BFF) and he hasn't skipped a beat and is such a happy boy. She was just mentioning to me that they haven't had any pictures taken of her and her husband since their wedding (4.5 years ago). I know they would love to have their family pictures taken by you, as she's mentioned that she loves your work. We are so blessed to have them as friends and I would love if they won this contest. After a tough year, they could greatly benefit from some good news coming their way! Thanks!